Audiences can explore Latino culture in the Midwest or hear stories of Nashville in verse through podcasts developed through an innovative podcast training program from PRX and funded by a $1 million grant from the Corporation for Public Broadcasting. Project Catapult brought together seven public media stations across the country to work with PRX, the public media creator and distributor that runs the Radiotopia podcast network, to develop their podcasts and improve their capacity to produce digital content that is sustainable and relevant. The five-month boot camp kicked off in January at the PRX Podcast Garage in Cambridge, Mass., and concluded earlier this month with a live showcase in Boston. 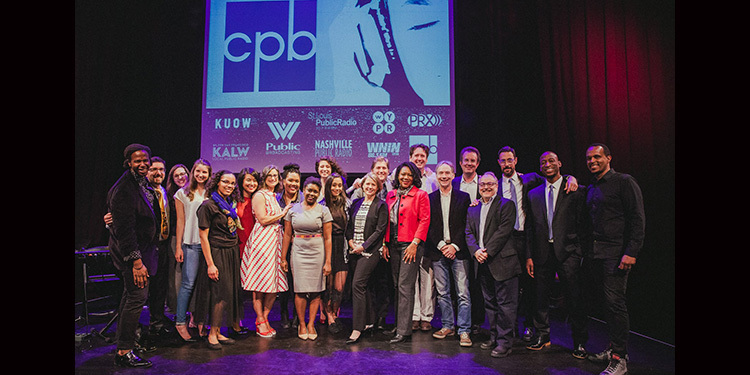 The program has helped stations lay groundwork for more digital innovation and has brought a cohort of diverse voices into public media podcasting. Three of the participating stations brought concepts to the Podcast Garage and four — St. Louis Public Radio, West Virginia Public Broadcasting, Baltimore's WYPR and San Francisco's KALW— brought nascent podcasts that they hoped to take to the next level. The Project Catapult curriculum included not only digital content development but also audience engagement and monetization, important aspects for building sustainability and multimedia capacity. Inflection Point, KALW-San Francisco. Creator and host Lauren Schiller shares stories of extraordinary women leading change. Us & Them, West Virginia Public Radio. Launched in 2015 from award-winning producer Trey Kay, “Us & Them” features issues, disputes or ideas that divide people into longstanding, entrenched camps. We Live Here, St. Louis Public Radio. This podcast, launched after the death of Michael Brown in Ferguson, continues its in-depth exploration of how systemic racism affects communities in and around St. Louis. Que Pasa Midwest, WNIN-Evansville, Ind. This bilingual podcast, hosted by WNIN’s Paola Marizan, tells the stories of Latinos chasing their American Dream, El Sueño Americano, in the Midwest. Versify, Nashville Public Radio-WPLN. Premiering in August, “Versify” has Nashville poets travel to neighborhoods across the city, hear stories from people they’ve never met, and then capture them in verse. Out of the Blocks, WYPR-Baltimore. Each episode is a collage of life-stories from a single city block and features sounds from the block fused with an original musical score. Second Wave, KUOW-Seattle. In “Second Wave,” premiering in August, host Thanh Tan will share her quest to better understand her Vietnamese American identity and to explore the heartbreak and triumph of refugees who fled Southeast Asia after the Vietnam War to pursue new lives in the United States.